Discussion in 'Online Games - News and Reviews' started by Marina, Sep 6, 2017. Rumor has it that the innovative online casino software group, Big Time Gaming is planning a real-money release of its fantastic slot game, White Rabbit. 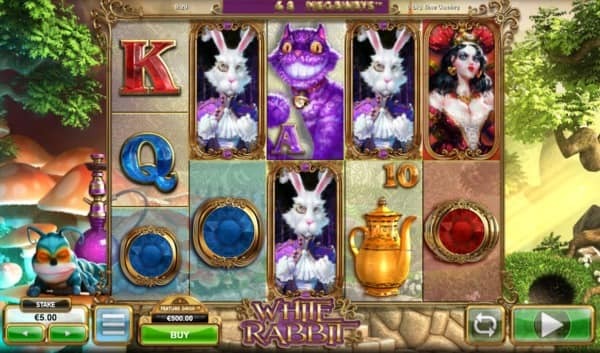 Based on Lewis Carrol’s classic tale of Alice in Wonderland, White Rabbit slot focuses on the bobtailed bunny who leads Miss Alice down the hole into Wonderland. Players will love the look of this game, thanks to the real talent of Big Time Gaming’s creative team. It brings the storybook character theme to life thanks to bright colors and unforgettable landscapes. An audio matching the theme of the game makes the gaming experience even more appealing. to all the possible winning combinations in this slot game. The Megaways format means that players could potentially win on thousands of lines each and every time the reels are spun. While low limit players may find White Rabbit slot most appealing, high rollers will definitely find their place at the reels as well. White Rabbit is mobile optimized, which means that it can be enjoyed on most mobile devices for the ultimate in gambling on the go. Big Time Gaming has added a “buy a feature” option where players can essentially purchase their way into a bonus feature. No more are you dependent on Lady Luck alone! “Buy a feature” tokens are retained as long as the game is played at one particular casino. 3 white rabbits trigger 15 free spins! Once players hit 12 rows during the free spins feature on any reel by getting Cupcake symbols, they earn a retrigger. The White Rabbit’s pocket watch determines how many extra games players can earn (up to 12). In addition, the reel turns into a Queen’s Reel that has extra Queen symbols and wild symbols for extra reward potential. in creating games for the industry. Huw McIntosh, the Chief Technology Officer, has worked for over a decade in the gaming industry, especially for companies such as Openbet and New Tech Media. merged with Orbis and had its name changed to OpenBet. Over the years, Big Time Gaming has created exceptional games found in many online casinos, including titles such as Danger High Voltage, Dragon Born, Bonanza and Queen of Riches. White Rabbit Slot from BTG will launch today exclusively at LeoVegas Casino! The game will be live at more online casinos on 8. November 2017!